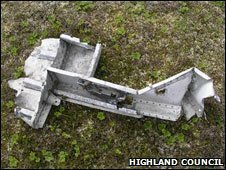 Wreckage found in Scotland has helped a team in its efforts to rebuild a type of aircraft that dropped the RAF's first bombs of World War II on Germany. The Whitley Project is trying to reconstruct an Armstrong Whitworth Whitley bomber for museum display. Remote Scottish crash sites were among those visited by the team. The project's Dr Elliott Smock, who in 2000 tried to find crashed Japanese aircraft in Asia, said the initiative was at the stage of building the plane. Parts of wreckage retrieved with the RAF's permission from crash sites in Scotland and Wales are being stored in a barn in Norfolk. New parts based on original components are also being made. London-based Dr Smock said no Whitworth Whitley's remain in existence and hoped that, once completed, the reconstructed bomber would fill a gap in the fleet of historical aircraft that survive today. 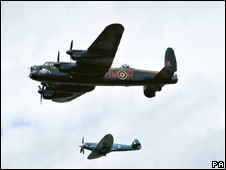 He said: "The Whitley was a generation of aircraft that came along before the Lancaster. "When war broke out it was one of the few aircraft the RAF could fly to take the war to Germany." Dr Elliot turned his attention to finding the locations of crashed Whitleys after going in search of downed Japanese war planes in the Pacific when he was a medical student. From trekking through jungle in Papua New Guinea, he walked to hill and mountain tops in Wales and Scotland to inspect the remains of the Coventry-built heavy bombers. Sites in Scotland include Glen Carron in Wester Ross, East Scaraben in Caithness and Glen Esk in Angus. Not much now remains of the aircraft in Caithness which was part of 612 Squadron of Coastal Command. It crashed on 1 May 1941. A section of front turret outer ring was found providing what Dr Smock said was "excellent information" on how the aircraft was put together. Large sections - such as the engines - were thought to have been removed after the crash and other items later taken by souvenir hunters. The crash site is among those catalogued in Highland Council's Historic Environment Record. A Whitley that crashed in Glen Carron was returning from a raid on the German city of Cologne on 26 February 1941, while the Glen Esk aircraft was lost on the night of 26 May 1944 after it flew out from RAF Kinloss in Moray. Later in the war, Whitleys were used in patrols against submarines but also for training purposes and towing gliders.